If you have cold hands, Qigong can warm them up. Qigong increases the Qi and blood flow to the hands. The hands get pleasantly fat and full and the palms and fingers turn reddish. Sometimes there is a red and white mottling. Warm hands indicate many good things: Your internal organs are charging up, excess energy in the heart is distributed to the periphery, overall blood flow is better. Hot hands can also indicate that harmful excesses of heat in the head or heart are being safely shunted to the hands–a place much better for body heat to reside. Qigong can warm cold feet too, which means the Qi and blood flow through your legs is improved and the body is more rooted, balanced in energy, and infused with life force. 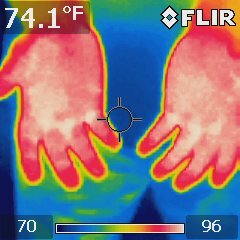 Above is a photo of my hands and four of my students’ hands taken at a Qigong class with a heat camera. The heat camera is a special device designed for finding heat leaks in houses. It works great as a Qigong tool of exploration. 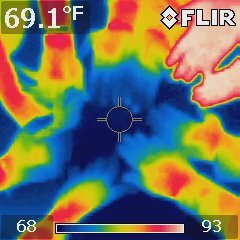 My hands are the white ones ringed with red, which indicates a lot of heat in them. Notice the palms of the others, which tend toward a middle-heat yellow with some warmer orange-ish red. Also notice the blue in the fingers, indicating coolness. This photo was taken at the beginning of a Qigong Practice, showing my Qi-charged hands which are habitually, healthily warm already. In 1995, after practicing Qigong regularly for about a year, my hands turned on. They get pleasantly warm almost every time I practice my healing methods on someone, or practice Qigong exercises. They are warm to start with and get warmer. Many exercises of Qigong help equalize the Qi, blood, lymph, and neural energy between your hands. Balanced hands indicate a balanced body. The blood vessels on both upper limbs are equally open and strong. The divisions of the cerebral cortex–left and right, front and back– are in equilibrium. The nerves coming from the spine to the hands are engaging equally as they travel through the shoulder complex, arms, and into the hands. The heat photo of the above pair of hands shows an imbalance between left and right. The right is much hotter. Qigong can help balance the temperature of these hands. These are my hands after 50 minutes of Qigong practice and teaching. Note that even the fingers are quite warm. An important part of my hands-on healing work involves using each finger, both independently and in conjunction with the rest of the fingers, the palm, and my whole body. I think that this engaged finger individuation also helps with keeping the Qi alive and warm in my hands.